A study by Spanish researchers, published over the summer in the scientific journal Environmental Science & Technology, raises an alert on the potential of nanoparticulate sunscreen ingredients (titanium dioxide and zinc oxide) to cause damage to marine environments. They affect phytoplankton in particular, which constitute the base of the food chain for marine life. The researchers first point out that sunscreens have been shown to give the most effective protection for human skin from ultraviolet (UV) radiation. But the filters used in these products are far from being safe for the environment. Antonio Tovar-Sánchez and David Sánchez-Quiles, the co-authors of the study, maintain that such substances accumulate in the sea and have toxic effects on marine organisms. When sunbathers splash into the ocean to cool off, some of their lotions and creams get rinsed into the water. The problem is that titanium dioxide and zinc oxide nanoparticles, which are common ingredients in sunblock, can react with ultraviolet light from the sun and form new compounds, such as hydrogen peroxide. This molecule is potentially toxic for phytoplankton in particular, which are one of the ocean’s tiniest inhabitants and are the main course for many other marine animals. “In this report,” they state, “we demonstrate that photoexcitation of inorganic UV filters (i.e., TiO2 and ZnO nanoparticles) under solar radiation produces significant amounts of hydrogen peroxide (H2O2), a strong oxidizing agent that generates high levels of stress on marine phytoplankton. Our results indicate that the inorganic oxide nanoparticle content in 1 g of commercial sunscreen produces rates of H2O2 in seawater of up to 463 nM/h, directly affecting the growth of phytoplankton. Conservative estimates for a Mediterranean beach reveal that tourism activities during a summer day may release on the order of 4 kg of TiO2 nanoparticles to the water and produce an increment in the concentration of H2O2 of 270 nM/day. Our results, together with the data provided by tourism records in the Mediterranean, point to TiO2 nanoparticles as the major oxidizing agent entering coastal waters, with direct ecological consequences on the ecosystem”. 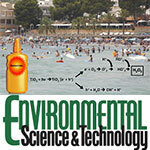 • See the study “Sunscreens as a Source of Hydrogen Peroxide Production in Coastal Waters”, published in the journal Environmental Science & Technology.